Little Bellies Animal Biscuits 100g (12 mos..
Little Bellies Mini Gingerbread Men 100g (1..
Little Bellies (Baby Bellies) Organic Carro..
Little Bellies (Baby Bellies) Organic Blueb..
Little Bellies (Baby Bellies) Organic Berry..
Little Bellies (Baby Bellies) Organic Pumpk..
Little Bellies (Baby Bellies) Organic Sweet..
Piccolo Squares Smooth Teething Wafers - Co..
Piccolo Squares Smooth Teething Wafers - Ma..
Organix Raspberry & Blueberry Rice Cakes St..
Organix Carrot & Tomato Rice Cakes 50g ..
Googly Fruit Organic Freeze Dried Banana &a..
Peppa Pig Organic Raisins 7 x 14g mini pack..
Organix Banana Baby Biscuits 54g (10 months..
Little Freddie Organic Milk Biscuits (4 x 2..
Baby Bellies Organic Softcorn are soft puffed corn snacks with banana. These delightful baby snacks melt easily in the mouth to encourage safe self-feeding. Our MORE TO EXPLORE range brings new adventures in taste, shape and texture to help promote independence. We believe nurturing comes naturally, so we simply provide good foods that parents trust throughout their child’s natural development. *What is Baby Grade? Not just organic. 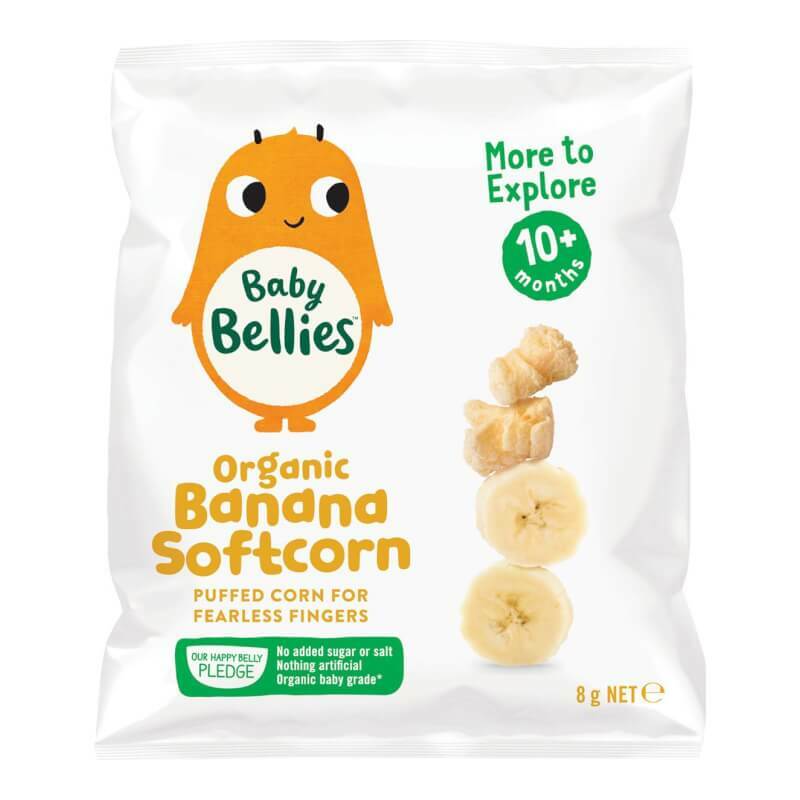 It’s our extra commitment to you that all our organic ingredients, recipes and suppliers have been specially screened and selected to ensure they are appropriate and safe for growing little bellies.